Sunday, May 30, 2010 – Catch Up On Blog Day! Whew! I can’t believe how long it’s been since I’ve done a blog entry! Since we arrived here at the ranch, we’ve settled into a rather pleasant routine. On days when our client is here, we work for a few hours, on days when she’s not we go about our business. We started out putting the horses in the overgrown arena, then bringing them into a couple of box stalls (not the same ones from the first night, they were a bit claustrophobic, but a couple of large foaling stalls) with split doors to an outside run. Unfortunately, the winds are so consistently strong here, we weren’t able to leave the doors open on most nights, as it blew the bedding around all over the place. Once the arena was played out, we started putting them into a larger pasture during the day and still bringing them in at night, until eventually we let them out into the pasture full time, once their stomachs got used to the green grass. 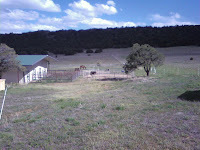 We’ve ridden around the property on two different days, as well as done a little arena work with them. Finally, today, we loaded them up and drove down to the San Isabel National Forest, to the Indian Creek Trail. This is a 12+ mile linear trail that goes from it’s north Trailhead south to the Bear Creek Horse Camp. We weren’t ready to do anything like 20 miles, we just wanted to take a fairly short trip, so we estimated that we could go about 3.5 miles from the north entrance to near the top of Raspberry Mountain, the highest point on the trail for a picnic. The road to the trailhead was rough in some places, and if it had been wet, 4-wheel drive would have been a must, but we managed with our pickup. From the trailhead, it was all uphill, starting at over 8000 feet and working up to over 10000. The trail was dirt and some stone, so we decided to go without boots. I had done a really good trim the day before, and their soles were incredibly hard from the local terrain, so I was pretty confident they would do okay without boots. It was a lovely ride, the climb was mostly gradual, the views were absolutely spectacular! There was one place where you felt you could see all the way to Kansas City it was so flat and went on forever, and other places you could see the snow-topped mountains of the Spanish Peaks and even Pikes Peak to the north. Outstanding! We even passed a few snowbanks on the trail, and one blocked most of the trail, so I had to get down and persuade my gelding to edge around it along the dropoff. He did great once I showed him how, and Hubby’s mare followed right along As we neared what we thought was the top, my horse began taking breaks every 40-50 feet to catch his breath. The air is definitely thinner up there! I’m glad they had a chance to acclimate somewhat beforehand (the ranch is at 7000 ft.), but we took our time and eventually came to a nice spot on a ridge that had views in both directions, so we stopped there for lunch. Horses got oats and feed, we had a nice healthy snack. The way down was much easier, and the horses were much friskier going downhill. Passed a hearty hiker on her way up, one who knew trail etiquette, fortunately. We arrived back at the trailer before we knew it, following the babbling Indian Creek for the lower part of the trail, admiring the views along the way. A gorgeous ride, a beautiful day. 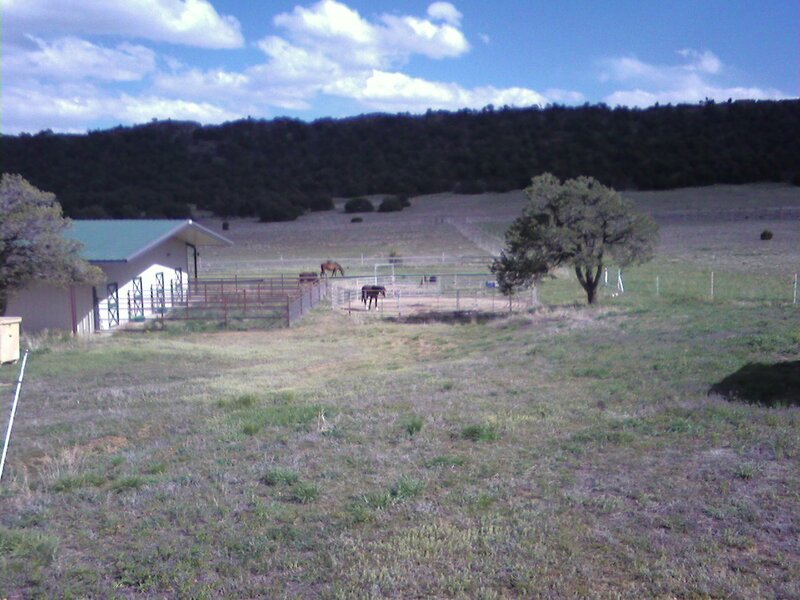 We needed to get a few things at the grocery store, and discovered the cute little town of LaVeta didn’t really have a grocery store, so we had to drive into Walsenburg to go to the Safeway there, got what we needed and headed back to the ranch. The horses galloped across the pasture afterward, confirming my opinion that their feet have toughened, and had no ill effects from the stony parts of the trail. Settled in for the evening, then back to our adopted routine! Worked with our client for several hours, as well as getting caught up on our mutual activities, and was otherwise an uneventful day, until the very last. It had gotten quite cold and damp during the day (though it had been lovely in the morning), and when I checked on the horses in the arena, discovered that Hubby’s mare was shivering, so we decided to get them into a couple of the stalls in the barn. Several of the stalls open directly to the outside by the arena, so we led them in there for the night. They seemed quite restless, almost like when they are outside and they can smell a critter like a bear or something, but after a little while, the mare stopped shivering, though she still seemed restless. Eventually we closed up the barn and turned out the lights, looking forward to a good night’s sleep. Was up and at ’em early again, grabbed some coffee and headed out, though not without some more excitement. When we first got up, the sky was cloudless and the wind had dropped, but as soon as the sun came up, so did the wind. After a short time, we looked out the patio door and saw this “cloud” (see pic) approaching at a rapid pace. At first we thought it was a dust cloud, but we soon discovered it was moisture, like fog that was being herded by the wind rather than dispersed by it. It soon overtook the RV, and those were the conditions as we left, though by now we had a much appreciated tail wind. We left the moisture behind in about an hour, breaking out into blue sky again. Crossed the border into New Mexico, and it wasn’t long before we saw the snow covered mountains again. We soon got on the freeway for the long climb up over the border to Colorado. Stopped in Trinidad at Tequila’s restaurant for lunch (chips and salsa weren’t nearly as good as at the Dixie Cafe! ), but it hit the spot. 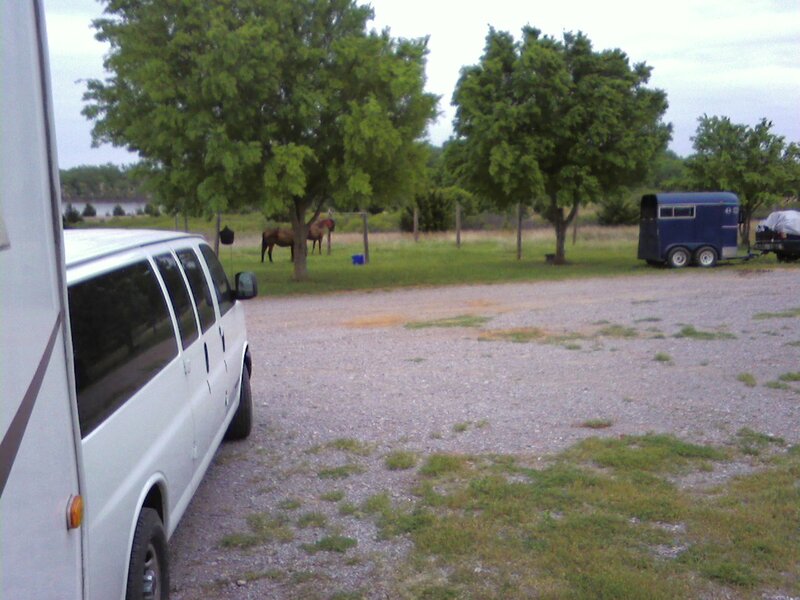 Rolled into our client’s ranch about 2:00, put the horses into a grassy arena, parked the RV and waited until she came home. A lovely spot, tucked away in the foothills of the Rockies, a barn full of lovely albeit unused stalls, all with runs of their own. A wild stallion who had been roaming the neighborhood was in a round pen awaiting it’s owner’s return, and four more horses were grazing peacefully out in a pasture. We are looking forward a bit of a more relaxed pace, between working occasionally with our client, getting caught up on work, and hopefully depositing a few more hours in our sleep banks. Well, Oklahoma certainly lived up to it’s windy reputation today! We had wind and spotty rain all night, and the air was full of moisture in the morning, almost like a fog. After packing up, we headed into 50-60 mile per hour headwinds and crosswinds. NOT a pleasant drive! Our gas mileage went way down, and we finally had to take a break in Pampa, TX for a meal, just to get some circulation back in my knuckles! We found a great little restaurant next to Wal-mart called the Dixie Cafe. Hubby had a catfish dinner (with SIX fillets!) and I had sizzling fajitas. The chips were the lightest, crunchiest chips we’d had in a long time, and the salsa was fresh and chunky, not like those marina sauces so many Mexican restaurants try to pass off as salsa. Anyway, needless to say we had tons of leftovers. At one point, I had to go back out to the van, and it was like being in a hurricane! I had to turn my back to the wind a few times, and the wind literally stopped my forward progress on several occasions. I looked like on of those crazy weather guys standing out in a hurricane, getting buffeted around like a puppet on a string. I was not looking forward to getting back on the road with my high profile vehicle, but fortunately, by the time we finished lunch it had dropped down a few mph at least. After getting gas a groceries at Wal-mart, we headed cross country again for the XIT Rangers Club in Dalhart, arriving about 6:00. 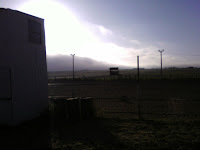 We were met by manager Peggy, who happily helped us get the horses settled in a good-sized pipe corral, and the RV parked up alongside the arena. The wind had died down some, but it was still blowing pretty good for a while. It was such a shame that the one day when we would be driving on pretty flat terrain (thus should have gotten better gas mileage), we ended up bucking such a wind. Pretty scary! We made it intact, though, and that’s the important thing! Very relieved that today’s drive will be a short one, though be both woke up early and were raring to go by 9:00. 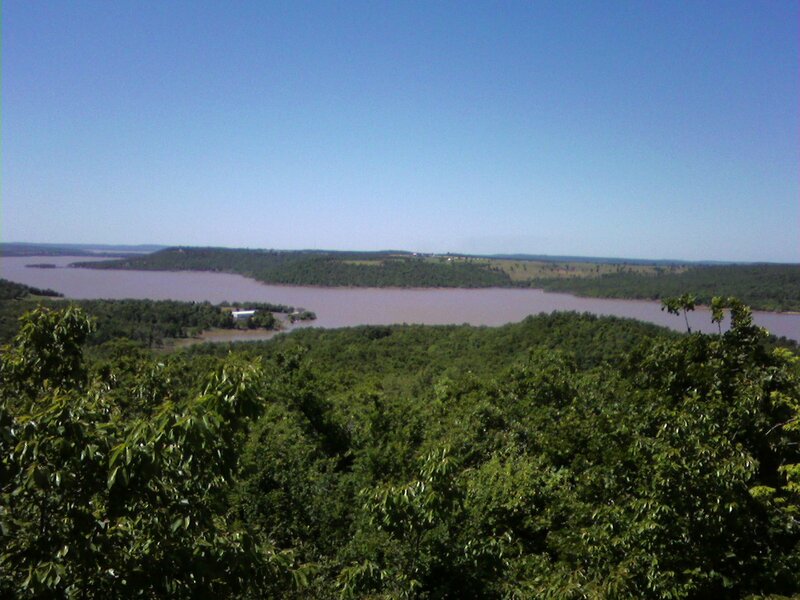 Stopped at an IHOP just west of OKC for breakfast, and headed straight for Foss State Park, which we found with no problems at all. 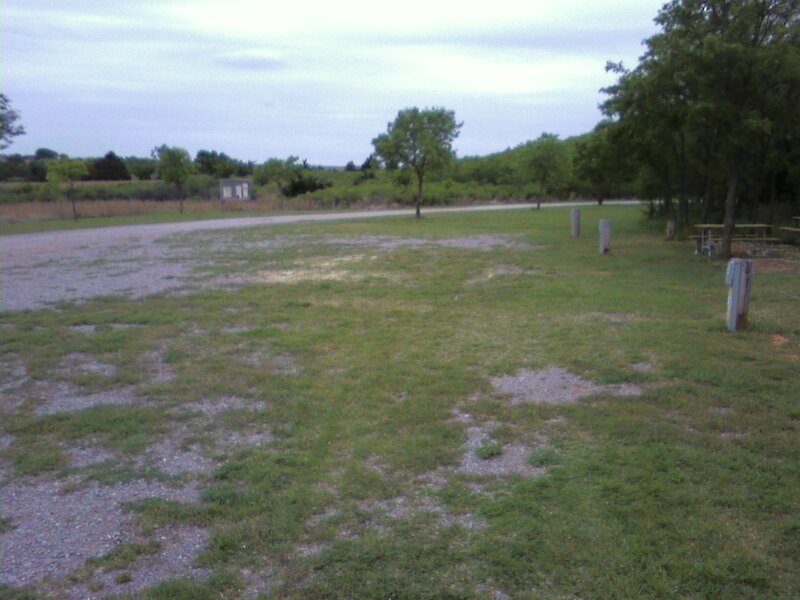 We partook of the RV dump before pulling into the equestrian area. The horse camp is quite ordinary, and reminded Hubby and I of the one at James River State Park in Virginia. All the RV spots were lined up in an open row, and across the street there were poles for highlining. There was water and electric at every sight, and the grass was long around the poles, a good indicator of how long it’s been since it’s been used by horses. Of course, we were the only ones there. We were quite close to a large lake, and the scenery was quite flat, though it looked like there might be spots that would be a bit more interesting. We aren’t going to have a chance to find out, though, as we have to drive again tomorrow. Though it started out as quite a nice day, it began getting cloudy and windy later in the day. Hubby even managed to get the satellite dish up before the day got ugly. We rested, watched movies and napped throughout the day. Wished we had a chance for a day off, but no rest for the weary for a while! We did, in fact, get to sleep late, or at least Hubby did. I got up around 7:30 and went back to working on my horse camp map, and to look for a place to stay overnight near Amarillo. I had received an email from our client in Colorado, apparently she has a big speech next Thursday, and wanted to know if we could get there in time to help her, so we revamped our schedule again. Now instead of spending a day at Foss State Park to ride, we need to just stay the night Sunday, and move to an overnight stop on Monday, then get to her ranch by Tuesday. After a shower and breakfast, I went back online and found what looks like a perfect place, right enroute, in a place called Dahlert, TX, about 30 miles NW of Amarillo. It looks to be just about halfway between Foss Park and the ranch. Having made that decision, we packed up, took the shuttle to the airport (we had returned the car early yesterday), got our seat assignments (note to self, Row 31A-B on an American MD-80 are just behind the service bulkhead, making for lots of leg-room and a cozy atmpsphere, but right next to the engines so earplugs are a must! ), picked up lunch at an airport Applebee’s, returned to the help desk for our passports which were inadvertently left behind, and proceed to our first flight of the day. After a short layover and even shorter flight, we were back in OKC and freeing the dogs from captivity by 6:30, petting the horses, saying thanks to our hosts for taking such good care of all our guys, watched a Paul Newman western, then fell into bed, exhausted from our travels. I swear, traveling by air is even more tiring than driving hundreds of miles! After the free breakfast at the hotel, we headed back to Richmond. I had contacted two clients, one who said they had already mailed a check but asked us to lunch to discuss future plans, which we did, and the other who had a check waiting for us as we passed through the city on our way to the hotel. We arrived at the Airport Hampton (a very good one) at about 3:00, then I spent the rest of the afternoon updating my Google Earth maps with horse camps, a job I had already done once before my computer crashed last October, but haven’t had time to fully recoup. Finally settled down for the night, having microwaved a couple of frozen dinners we had bought the day before when we thought we would be in DC, and finished off a bottle of wine after cocktails. Our flight doesn’t leave until 1:25, so the plan is to sleep as late as we can, get breakfast just before 10:00 when they finish serving, leave about noon, and be back in OKC by 6:00, God willing and the creeks don’t rise! Stopped to shop in Fredericksburg, arriving at the hotel in DC at just about 8:00. Cracked open my computer and checked my email, which had been busy in my absence. At around 4:00, the was one confirming a meeting room. Around 6:00, the was a problem developing in the schedule, and would it be possible to move it back to Richmond on Saturday. By 7:30, just before we arrived at the hotel, it was determined that the entire weekend had suddenly been disrupted (apparently by a funeral), that the client simply wasn’t going to be able to meet with us at all that weekend. Profuse apologies were offered, and one more email from me to confirm that there weren’t likely to be any further changes had Hubby and I revamping our entire schedule (Good thing we’re so flexible!) We decided to move back to Richmond tomorrow, get a hotel near the airport, and see if we could pick up a couple of checks from clients in the area. We went to bed disappointed at the outcome, but happy to add more miles to our frequent flyer program, at someone else’s expense! Got up with the alarm at 7:00, on the road shortly thereafter, picked up lunch at a Wendy’s, though, alas, they stopped serving Hubby’s new favorite fish sandwich. Apparently it was just a temporary promotion, so we ended up with burgers. After stopping at Wal-Mart for some shopping, we arrived at Robinson’s around 2:00, where we got the horses settled into two big lovely stalls, each with an oversized run leading out behind them. A very busy place, with lots of people and dogs coming and going. We let our canines wander as well, and they soon made friends with everyone, from old Abigail to little yapper Rusty, and did their best to befriend a rather skittish German Shepherd who had apparently been abused in the past so tried to avoid everyone. By the time we settled in that night, we practically felt like it was a second home. The only drawback was that it was located right on the I-40 freeway, so there was a constant thrum of high decibel traffic, making every conversation at loud restaurant level just to be heard. Of course, that also made it very convenient, which was what we needed most at this juncture. My last check of email for the night revealed that there was to be a last minute change of plans with our client. Instead of meeting in Richmond as planned, it was now to occur in Washington, DC. It was too late (and too expensive) to change flights now, so we just decided to change our hotel to our favorite little boutique hotel a block from the Capitol and just drive up from Richmond, having already reserved a rental car anyway. Went to be early so as to be well-rested for our long day ahead tomorrow. 4 Hubby decided we needed to get out for our ride early, so we set the alarm for 7:00, and were out by about 9:30, all booted up and ready to go. We hit the trailhead, which was the electrical easement that started out rocky and got worst. After a few yards, we turned onto a side trail into the woods, and were met with very narrow and rocky trails. This is the narrowest trail we’ve been on for a long, long time, constantly being brushed with trees. My horse, who loves a challenge, found it quite interesting for a while. Eventually, though, the rocks were really not fun. At one point, one of my gelding’s boots had started to slip off, so I had to stop and reset it. Then, just as we came up on the road, Hubby’s horse, who was uncharacteristically in front, caught a running deer out of the corner of her eye and made a dramatic move sideways. Although Hubby had just tightened her girth, so the saddle didn’t slip, she moved so far that Hubby couldn’t hang on and ended up on his bum. Fortunately, it was fairly soft ground, and he landed on the opposite hip than his last fall, so he was up and around after a few minutes. His mare just went far enough to find a patch of nice grass, so I managed to catch her with no problem. We then had trouble finding where we were supposed to cross the road, and once we did find it, we had trouble finding the trail. Either we were way off, or the trail was such a mess it was impassable. Granted, there was a sign saying some parts of the trail had some obstables due to an “ice storm”, but you would think by May someone would have made an effort to clear the trails a bit. We turned around and headed to the campground road just to get out of the woods. I had to reset my boot again, this time because the cotter pin went missing. 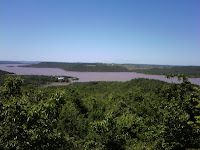 Then we headed up along the road, where we were rewarded with a lovely view of the lake (see pic). By now, Hubby just wanted to get back, and I didn’t really want to either negotiate impossible trails or just walk along a busy road. The shortest route back was straight down the hill at the power line easement again, and it was very rocky and very steep, and not much fun. We decided to at least go down to the lake, as we had seen a multitude of horse tracks when we had walked down yesterday evening (to watch the sun set over the lake). We were there about 15 minutes, working on getting the horses to wade along the edge (which Hubby’s mare managed, but my gelding only got in long enough for a drink), then a park ranger came along and told us we had to stay on designated trails, of which the lakeside wasn’t a part. I guess she missed all the other horse tracks that preceded us. Anyway, we came back to the campsite, barely two hours after we left. The horses hadn’t even worked up a sweat, even though it’s over 80 degrees today. Well, we got them settled in, got ice on Hubby’s hip, had lunch, and went back on the computer to get some more (boring, but necessary) work done. Tonight we get ready for our departure tomorrow, having made arrangements to stay at the Robinson’s Barn Bed and Breakfast in Oklahoma City tomorrow, before we fly out on Thursday.